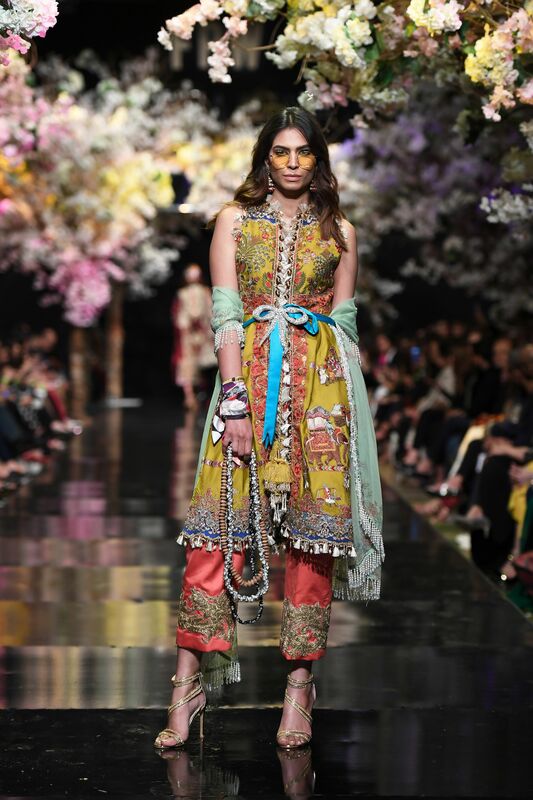 KARACHI: Fashion Pakistan Week’s Spring/Summer collections kicked off with a Sana Safinaz solo show. The designer duo displayed an array of modern cuts, colours and styling yet, were unable to bring something for everyone. Their creations did, however, ooze the essence of ‘Message from the East’. In his words, “The nations of the East should realise that life can bring about no revolution in its surroundings until a revolution takes place in its inner depths and that no new world can take shape externally until it is formed in the minds of men. This ineluctable law, which has been stated by the Quran in the simple but eloquent words, ‘Verily, God does not change a nation until it changes itself’. This explains that the offerings were all about reinvention and taking this into consideration, the showcase was spot on. 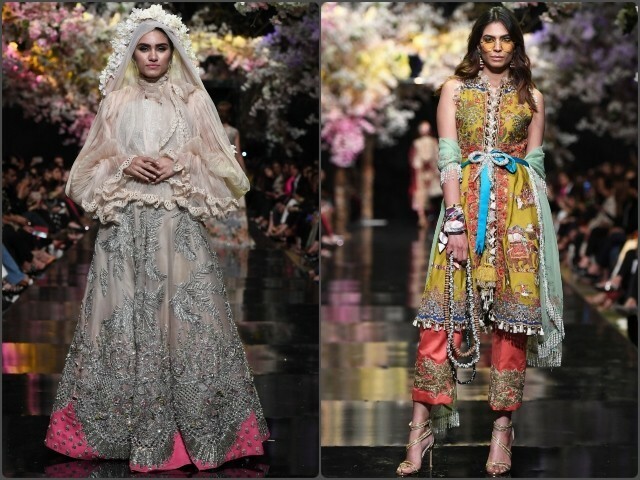 The designers aimed to put forth the notion of renovation and they surely did so by revamping certain attires for the modern woman. However, one cannot help but question the wearability of some of the pieces. The Victorian-esque dress for example; it is clear that it is a contemporary version of 19th century fashion with the ruffles and high neck, but how practical is it really? Having said that, we have to give credit where it is due. The thought and creativity gone into this collection is remarkable and we cannot turn a blind eye to that. The assortment of garments featured everything from light to heavy fabrics, bright to dark hues and several trimmings, some even theatrical. However, we can’t quite understand the use of suede and velvet for the upcoming season. Tulle, on the other hand, is perfect. This amalgamation of materials proves to be a bit puzzling, and that showed in the clothes. The event began with models strutting down the ramp in circular sunglasses and head bands, exuding bohemian vibes. 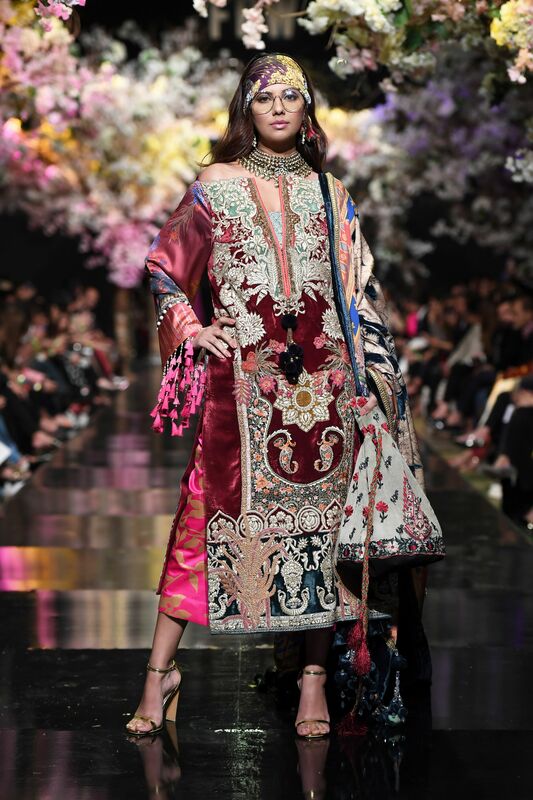 The clothes comprised vivid colours with a hint of pastels and the embellishments entailed everything from elaborate embroidery and silken thread work to pearls, tassels, kiran and rhinestones – borderline overbearing. But the accessories that stood out from afar were the funky bows cinching in at the waist, adding to the surprise factor. While they may not be everyone’s cup of tea, they are definitely a conversation starter. The silhouettes mostly included wide-legged trousers with long shirts featuring varying modish necklines. 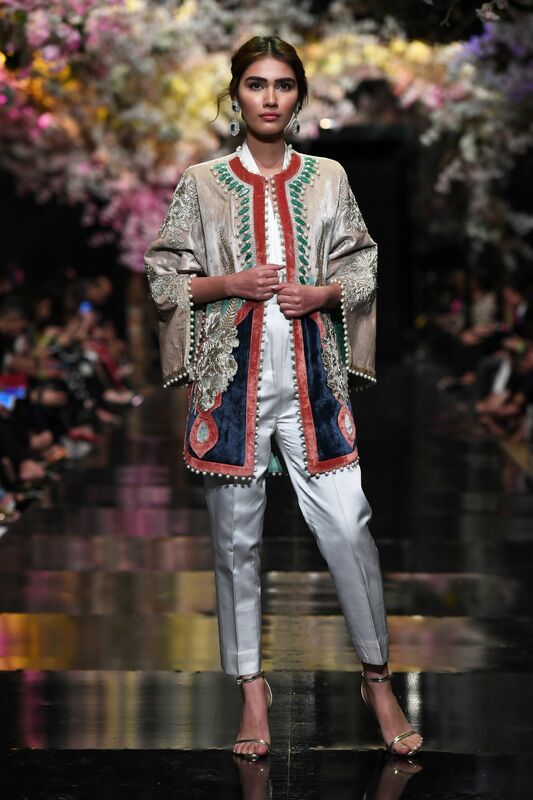 These pieces set the tone for the garbs that followed, which were of a similar theme but included overcoats, dramatic sleeves and cigarette pants in more neutral shades. 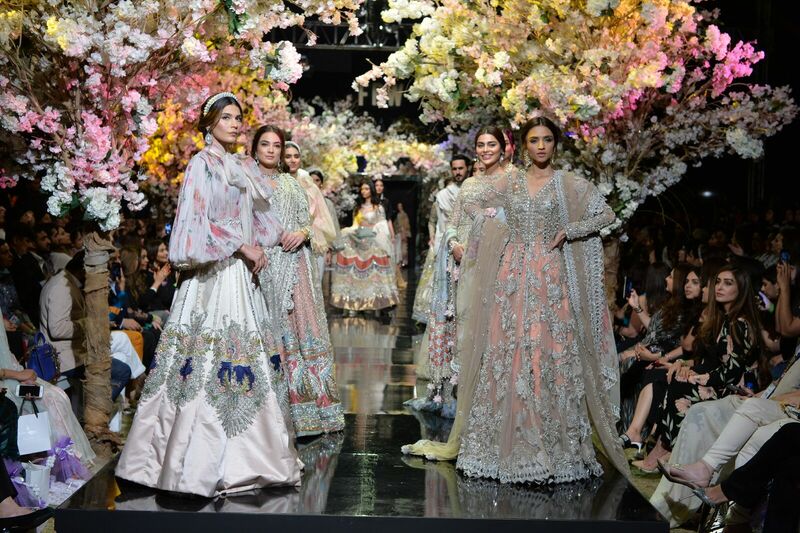 The drama ran onto the final portion of the show which saw models in veils donning bridal wear. The bows were a running accent throughout but truly caught everyone’s attention on these garments. Some may even consider them a mismatch. 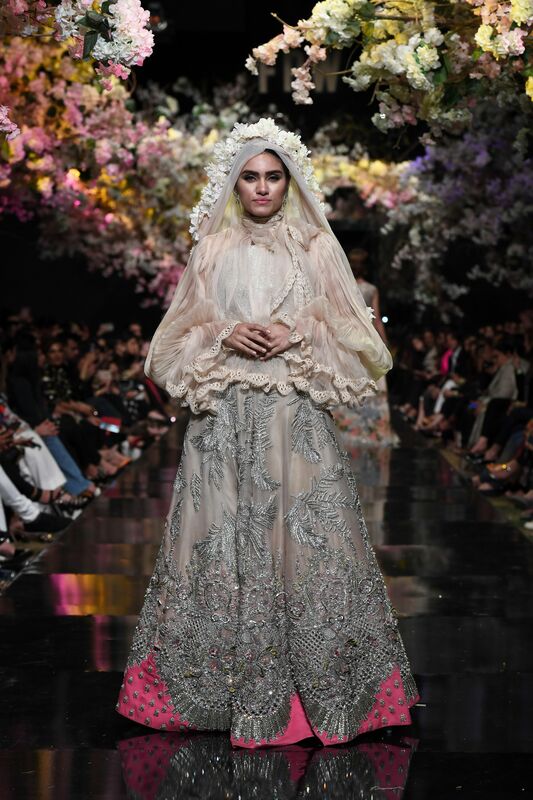 The bridal wear was heavily ornamented with a selection of sequins, crystals and 3D flowers with glimpses of laser cutting. 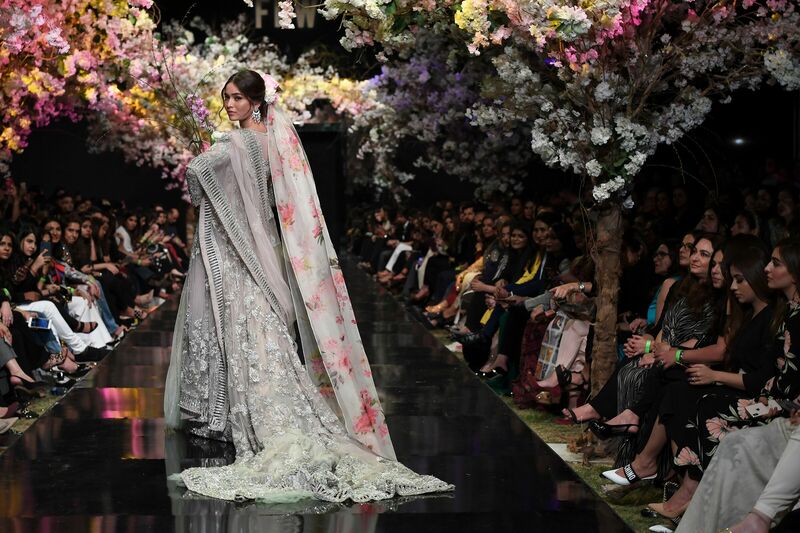 Fabrics ranged from satin to tissue formed into lehengas, cholis and gowns mostly in grey or silver, and teamed with floral dupattas. When you hear Spring/Summer though, you think pastel hues, airy draperies and lighter embellishments. But Sana Safinaz exhibited quite the opposite. Overall, the line was fashion forward and experimental but simply confused.